To get the most out of using credit, you need to optimize your credit cards and use them as a spearhead to improve your overall credit. Credit cards are convenient enemies. Almost everyone has a bad story about late fees, unauthorized charges, or overspending. Not surprisingly, many pundits (and parents) have a knee-jerk reaction to credit cards: “Using credit cards is the worst financial decision you can make,” they shout. “Cut them all up!” What an easy battle cry for people who want simple solutions and don’t realize the benefits of multiple sources of credit. But from one perspective, credit cards are like a delightful gift from heaven. They let you download your transaction history for free. Most offer free warranty extensions on your purchases and free rental car insurance. But unfortunately, there’s more to them than that. The truth about credit cards lies somewhere between these two extremes. As long as you manage them well, they’re worth having. If you can avoid the unreasonable fees and tricks, credit cards offer exceptional benefits. To get the most out of using credit, you need to optimize your credit card(s) and use them as a spearhead to improve your overall credit. This is all the more important in the wake of the credit crisis; if you don’t have good credit, it may be difficult to get an affordable home or car loan—even if you have a high income. Note: Below is an excerpt from the first chapter of my New York Times best-selling book, I Will Teach You To Be Rich. If you scroll to the bottom, you can download the entire chapter for free. Whether you’ve never had a credit card before or you’re thinking about getting an additional card, there are a few things to think about. Avoid those credit card offers you receive in the mail. Let’s cut to the chase: If you hate those credit card offers in the mail as much as I do, visit www.optoutprescreen.com to get off their lists. The average American receives twenty credit card offers every year, and four out of every thousand people accept them. The numbers are markedly different for students. Out of every thousand students who are mailed offers, 150 accept them, an astonishingly high number. Students—and young people in general—are especially susceptible to these offers because they don’t know any better. Let’s get real. Taking a credit card offer you get in the mail is like marrying the first person who touches your arm—99 percent of the time it’s the easy decision, not the right one. Most people know better and go out and find what’s best for them; they don’t just settle for the horrible offers that fall in their lap. For something as important as your credit, make the effort and pick a good card. There are options if you’re young and/or have no income. Getting your first credit card can be tricky, especially if you’re young. But there’s an easy solution: Get a secured credit card. These are cards that require you to put down a few hundred bucks in a savings account, and then the bank uses that as collateral to issue you credit. After a few months, assuming you’ve behaved responsibly, you can graduate to a regular (“unsecured”) credit card. To get one, call your bank and ask about it. Avoid cash-back cards, which don’t actually pay you much cash. People get really mad at me when I say this, but cash-back cards are worthless. “Get 1 percent back on all your spending!” Wow, if I spend $2,000 per month on my credit card, I’ll get back $20. 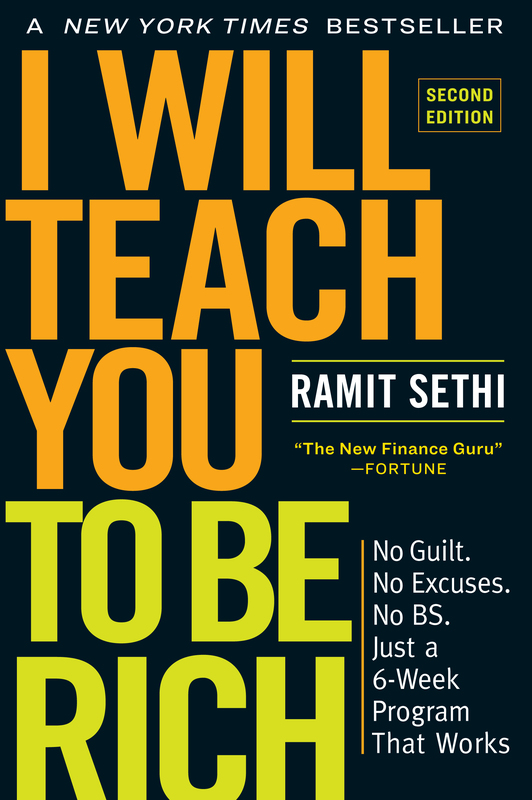 “But Ramit,” you might say, “twenty dollars is better than nothing.” Sure, but what if you could save more by getting a free $500 flight? It wouldn’t be as obvious as receiving money each month, but in the long term, you’d save more with a travel rewards card. Compare cards online. The best way to find a card that is right for you is by researching different offers online (try www.bankrate.com). In most cases, the simplest credit cards are offered by your bank, so this is often a good place to look. They’ll connect with your bank account and you can choose from a variety of options, including credit limit, rewards, and more. On the plus side, they’re easy to get without much research. The downside is that the rewards are usually fairly mediocre. Rewards are important. You’re going to be using this card a fair amount, so make sure the rewards it offers are something you’ll actually want. I travel a lot, so I got an airline card that gives me free companion tickets, free flights, and points for every dollar I spend and every mile I fly. I get multiple free flights per year, and each one saves me about $350. But if you hardly ever travel, this card wouldn’t make sense for you. Bottom line: If you’re getting a rewards card, find one that gives you something you value. Don’t go card crazy. Now that you’re in the market, you might be tempted by any number of card offers. But don’t overdo it. There’s no magic number of cards you should have. But each additional card you get means added complexity for your personal-finance system. Two or three is a good rule of thumb. (The average American has four credit cards.) Your credit score is based on overall sources of credit. Remember, there are other sources of credit besides credit cards. These include installment loans (such as auto loans), personal lines of credit, home equity lines of credit, and service credit (such as utilities). Now it’s time to take full advantage of your cards as a means to improving your credit. Optimizing your credit is a multi-step process. Yeah, we’ve all heard it, but what you may not know is that your debt payment history represents 35 percent of your credit score — the largest chunk. In fact, the single most important thing you can do to improve your credit is to pay your bills on time. Whether you’re paying the full amount of your credit card bill or risking my wrath by paying just part of it, pay it on time. Your credit score can drop more than 100 points, which would add $240/month to an average thirty-year fixed-mortgage loan. Your APR can go up to 30 percent. You’ll be charged a late fee, usually around $35. Don’t get too freaked out: You can recover from the hit to your credit score, usually within a few months. In fact, if you’re just a few days late with your payment, you may incur a fee, but it generally won’t be reported to the credit bureaus. Click here for a word-for-word script to use if you miss do miss a payment. Most people pay their credit card bills online now, but if you haven’t set up automatic payment yet, log on to your credit card’s website to set it up now. You: Hi, I’d like to confirm that I’m not paying any fees on my credit card. Credit Card Rep: Well, it looks like you have an annual fee of $50. That’s actually one of our better rates. You: I’d rather pay no fees. Which card can you switch me to that doesn’t charge fees? I’d like to make sure my credit score isn’t affected by closing this account, too. Can you confirm? Yes, I really talk like that. Your APR, or annual percentage rate, is the interest rate your credit card company charges you. The average APR is 14 percent, which makes it extremely expensive if you carry a balance on your card. Put another way, since you can make an average of about 8 percent in the stock market, your credit card is getting a great deal by lending you money. If you could get a 14 percent return, you’d be thrilled — you want to avoid the black hole of credit card interest payments so you can earn money, not give it to the credit card companies. So, call your credit card company and ask them to lower your APR. If they ask why, tell them you’ve been paying the full amount of your bill on time for the last few months, and you know there are a number of credit cards offering better rates than you’re currently getting. In my experience, this works about half the time. It’s important to note that your APR doesn’t technically matter if you’re paying your bills in full every month—you could have a 2 percent APR or 80 percent APR and it would be irrelevant, since you don’t pay interest if you pay your total bill each month. But this is a quick and easy way to pick the low-hanging fruit with one phone call. Lenders like to see a long history of credit, which means that the longer you hold an account, the more valuable it is for your credit score. Don’t get suckered by introductory offers and low APRs. If you’re happy with your card, keep it. And if you’re getting a new credit card, don’t close the account on your old one. That can negatively affect your credit score. As long as there are no fees, keep it open and use it occasionally, because some credit card companies will cancel your account after a certain period of inactivity. To avoid having your account shut down, set up an automatic payment on any card that is not your primary card. For example, I set it up so that one of my credit cards pays a $12.95 monthly subscription through my checking account each month, which requires zero intervention on my part. But my credit report reflects that I’ve had the card for more than five years, which improves my credit score. It involves getting more credit to improve something called your credit utilization rate, which is simply how much you owe divided by your available credit. This makes up 30 percent of your credit score. For example, if you owe $4,000 and have $4,000 in total available credit, your ratio is 100 percent, which is bad. If, however, you owe only $1,000 but have $4,000 in available credit, your credit utilization rate is a much better 25 percent. Lower is preferred because lenders don’t want you regularly spending all the money you have available through credit — it’s too likely that you’ll default and not pay them anything. To improve your credit utilization rate, you have two choices: Stop carrying so much debt on your credit cards (even if you pay it off each month) or increase your total available credit. Because we’ve already established that if you’re doing this, you’re debt-free, all that remains for you to do is to increase your available credit. Here’s how: Call up your card company and ask for a credit increase. You: Hi, I’d like to request a credit increase. I currently have five thousand dollars available and I’d like ten thousand. Credit Card Rep: Why are you requesting a credit increase? You: I’ve been paying my bill in full for the last eighteen months and I have some upcoming purchases. I’d like a credit limit of ten thousand dollars. Can you approve my request? Credit Card Rep: Sure. I’ve put in a request for this increase. It should be activated in about seven days. Just like with car insurance, you can get great deals on your credit when you’re a responsible customer. In fact, there are lots of tips for people who have very good credit. If you fall in this category, you should call your credit cards and lenders once per year to ask them what advantages you’re eligible for. Often, they can waive fees, extend credit, and give you private promotions that others don’t have access to. Here’s a list of credit perks that most of us have and we don’t even know it. You don’t have to be perfect to rebuild your credit starting today. Or the smartest person in the room. Or a type-A personality. In fact, with my six-week program to financial independence, you can start with any amount of money, do just a portion of what I suggest, and succeed brilliantly through good times and bad.